Have you ever wondered how an artist can take a block of marble and see the sculpture hiding inside or view a blank canvas and unveil the painting within? That same creative talent and vision are present today in modern “upcycle artists” who look at what many view as trash and see the beauty waiting to emerge. “There is a deep satisfaction in taking an item destined for the landfill and giving it new life,” notes native Indiana artist Ellen Leigh. Inspired by her great grandmother, who would mend clothes until they were unusable and then salvage the remaining fabric to make quilts, Leigh creates wall sculptures utilizing a patchwork of repurposed materials. Like most upcycle artists, Leigh began by experimenting with various discarded materials. 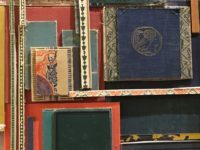 Only after working at the Indy Reads Bookstore in Indianapolis did she find the perfect source for her upcycled art — old book covers and bindings. While most of the books donated to this store are resold to fund adult literacy programs in the area, a number of books are either too damaged for resale or are simply unwanted by customers. These hard-to-sell books are first placed in the “pay what you can” cart and then considered for recycling. While book pages made of paper are usually recyclable, many of the covers and bindings are not because they are a mix of cardboard, glue, thread, and fabric. And although unwanted, many of these old book covers are works of art. Drawing inspiration from her grandmother’s quilts, as well as the history of the books themselves, Leigh thoughtfully creates her artwork. “I love taking something like a book cover which is heavy and clunky and reshaping its form into something that feels light, taking a very man-made form and manipulating it to a more organic form,” she notes. Leigh’s pieces exhibit movement and musicality, representing the passage of time from when the books were first printed and continuing their journey as they blend together to form new, upcycled art. To learn more about Leigh’s work, you can follow her on Instagram.